The Bishop of Derry has expressed the hope that people will rediscover something of the Irish Church’s “great Celtic tradition” of walking and ‘pilgrimaging’. Bishop McKeown was inspired to walk to Lough Derg after meeting Thomas Gallagher from Derry Cursillo when he made the pilgrimage to the island last year. 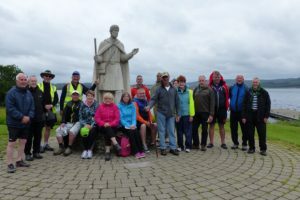 For the past five years, male members of Cursillo have walked from Derry to Lough Derg and this inspired the new bishop of Derry to suggest a pilgrimage to St Patrick’s Purgatory for the Year of Mercy, in addition to the usual diocesan pilgrimages to Rome and Lourdes. “For me, pilgrimages offer an experience of being a people on the move, pushing ourselves beyond our comfort religious and physical zone, non unlike Jesus was spend most of his time on the road with his disciples. He said that even for the secular world, there is a new discovery of the value of ‘pilgrimaging’ with others and that pilgrimages can be a great leveller. The first day of the pilgrimage covered 23.5 miles, from Derry City to Killygordon with a break in Ballindrait. Pilgrims stayed in Killygordon on the first night. The second day covered a further 20 miles to Pettigo. The third day covered the final four and a half miles to the island of Lough Derg. The Diocese of Derry will undertake a second pilgrimages to Lough Derg in August.